Everything is up and running, and autumn is finally here: leaves are turning red, orange and yellow; new exhibitions are in full gear. This time around, all of the galleries didn’t open on the same day. The galleries at Konstakademin and Hudiksvallsgatan opened on Thursday, October 3rd, and the Östermalm galleries opened on Saturday of the same week. There is a certain kind of calmness and everyone has settled into routine. When looking at the current exhibitions, one notices that there are quite a few artists not native to Stockholm who are showing. If there were any common threads, it would be dualism and ambivalence; perhaps that’s something that comes with the autumn season. Another thing that has been running through my mind recently, is how we actually perceive and critique art. The discussion has come up on several occasions lately, and has made me think of the difference between looking and actually seeing: just observing and critiquing. I want to view myself as a contemplative person, but then I run through exhibitions without actually taking-in what I’ve seen. But then again, if nothing catches my eye, or my imagination, I find it hard to focus. These are the exhibitions that I would take a second look at. Kent Iwemyr’s The Vintage Show, at Galleri Magnus Karlsson, led my thoughts to outsider art. But this is something else: insider art made to look like outsider art, or a little bit of both, perhaps? Iwemyr attended The University College of Arts in Stockholm, and after that, has worked as a teacher in art. This is his first major solo show since 2002, but his sixth solo show at the gallery. In this exhibition, Iwemyr returned to the images of his teenage years, to tell the stories of the people close to him. The paintings are quite naïvistic from afar, but when you get closer, some of them tell a darker tale. Kent Iwemyr was born in 1944, and lives and works in Hallstahammar, Sweden. He has had solo exhibitions in galleries in Sweden, the USA, Germany, Italy, Luxembourg, Switzerland and Bermuda. Morten Andenæs is showing for the first time at Galleri Riis in Stockholm, and his show is entitled enclosed circuit x. In March of this year, he showed a variant of this exhibition at the gallery’s Oslo branch. The works all stem from Andenæs’ ongoing project, Regarding the Middle Class. Thematically, it deals with boundaries, responsibilities and “freedoms", imposed on the individual from family and society. The show builds up an uncanny feeling with blinded/frosted windows. It continues in the hanging of the works, where there is a play between the photos hanging either too low, or too high. This is really apparent in the second room, where an extract of a series with life-sized handguns against a chroma screen are positioned at the same height as one’s stomach. These are opposite a non-picture (sky, cloudesque) that hangs too high. It creates uneasiness. The strange thing is, the cloud-picture is probably one of, if not the, most unpleasant one of all: nothingness is always scarier, and it presents an uncertainty of what it is you are actually seeing. Morten Andenæs (b. 1979) studied at The School of Visual Arts in New York, and lives and works in Oslo. Kirsten Ortwed is mostly known for her monochrome monument to Raoul Wallenberg in Stockholm, and her shaping of the public space. Through this, she explores the possibilities of space and the issues of material choice. Her show Run Time, at Galerie Nordenhake, revolves around a group of bronze sculptures that act as studies for a larger public commission – for a park in Stockholm. In the first room, a gilded group on the floor meets you, and then continues on with several other groupings of sculptures. They all take on certain characteristics: the Pusher, the Poet, the Demonstrator. They are described like doodles in space. Born 1948 in Copenhagen, Ortwed lives and works in both Cologne, Germany, and Pietrasanta, in Italy. Ridley Howard is showing his first major exhibition in Europe, Blues, Legs, Pools, at Andrehn-Schiptjenko. The show consists of a selection of eleven paintings with both figurative and abstract images. Howard’s paintings create a relationship between subject and image that is both aloof and intimate at the same time. The colors are bright and the brushstrokes invisible; they make up simple depictions of people, architectural spaces, landscapes. I was surprised by the effect that the paintings had on me. It is like experiencing something that is frozen in time, but of course, any picture is like that, in a way. This is different, though, because of the duality the imagery creates – kind of like robots with feelings. Emotion comes out through the colors, shapes and design, rather than through facial expressions. Ridley Howard was born in 1973, in Atlanta, Georgia, and lives and works in Brooklyn, New York. Disa Rytt, born in 1984, graduated from the Royal Institute of Art in Stockholm in 2012 and has her first solo show going on at Galleri Anna Thulin. Her process is both physical and intuitive. She searches for the contrasting point, where the different materials become significant in themselves. A play between fragility and strength is created when she challenges the thin fabric screen by running pastos wax of mixed colors with an iron spatula from the backside of the canvas. She focuses on what actually makes up a painting in terms of materials, space and time. The large-scale canvases let the light shine through them, creating a glow and a drama between light/darkness, visibility/ concealment. Dualistic qualities interplay with one another in the pictorial language of the pieces. Amy Feldman, born in 1981, is a New York-based artist and is currently showing her first solo exhibition, Stark Types, at AnnaElleGallery. The show is built up of gray abstractions that when taken together, construct an image, and in some ways, a body that encloses you. The shapes in the paintings are fun and big, but the color adds a certain perplexity and sadness. There are several things happening at the same time. 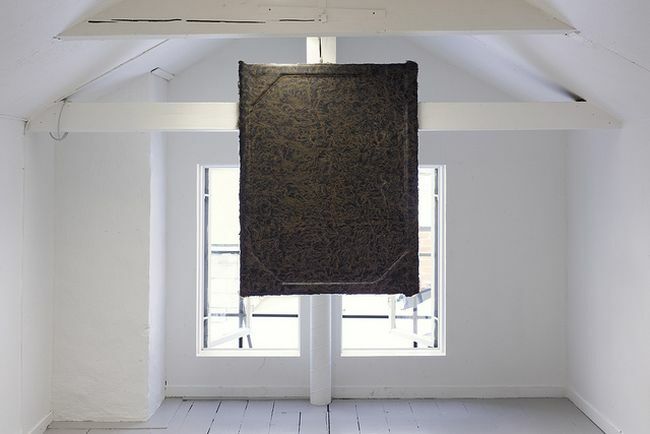 Karl Norin’s Think For Me, Please, at Gallery Niklas Belenius, is a collection of random, everyday objects, like sheets, rugs and fake furs, that have been compressed and polished, and then mounted into wooden frames. He looks at how objects can be seen as abstract, and how the process of casting paintings enables endless, random compositions. Norin tries to use abstraction as a tool for associations, and through that, tries to find hidden patterns and, perhaps, new meaning. Karl Norin was born in 1982 in Fjällbacka. He received his master's degree from the Royal Institute of Art in Stockholm, in 2013.